While ultrasound imaging is a commonly used diagnostic tool in obstetrics and gynecology, evidence suggests that the quality of ultrasound examination in clinical practice and ultrasound training in obstetrics and gynecology and radiology residency programs can be improved. To address these issues, the American Institute of Ultrasound in Medicine (AIUM) convened a forum tasked with developing a roadmap for quality improvement in ultrasound imaging in obstetrics and gynecology and set up a task force to establish a consensus curriculum and competency assessment tools for residency training. The results of these efforts are published simultaneously today in the American Journal of Obstetrics & Gynecology, Journal of Ultrasound in Medicine, and Ultrasound in Obstetrics & Gynecology. In an effort to develop better standards, the forum, Beyond Ultrasound First, under the leadership of Beryl R. Benacerraf, MD, from Brigham & Women’s Hospital, Harvard Medical School, Boston, MA, brought together representatives from many professional associations; the imaging community including radiology, obstetrics and gynecology, and emergency medicine among others; and government agencies, insurers, industry, and others with common interest in obstetric and gynecologic ultrasound. The aim of this forum, funded by AIUM's Endowment for Education and Research, was to increase and unify the quality of ultrasound examinations in obstetrics and gynecology with the ultimate goal of improving patient safety and quality of clinical care. Roberto Romero, MD, DMedSci., Editor-in-Chief for Obstetrics of the American Journal of Obstetrics & Gynecology, stated that "a curriculum in ultrasound for training future physicians in obstetrics and gynecology and related disciplines was necessary to improve the care of women and their unborn children. We are pleased to make available to the entire world the recommendations of the Task Force as well as the images and criteria for evaluation to strengthen education, enhance training, and promote high-quality medical practice." 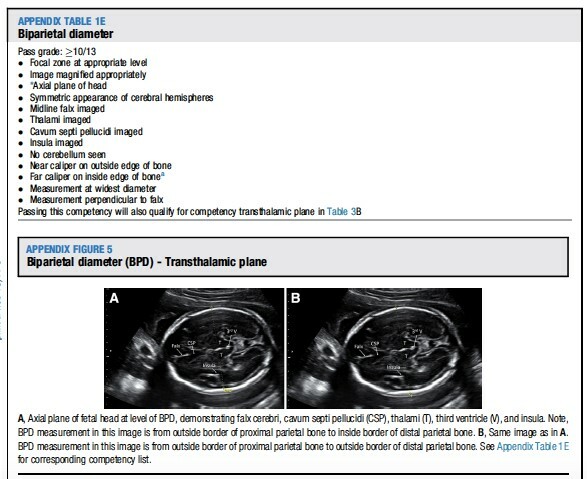 The multi-society task force that developed the curriculum to standardize teaching of ultrasound in OB GYN for Residents was led by Alfred Z. Abuhamad, MD, of Eastern Virginia Medical School, Norfolk, VA. Their efforts resulted in a consensus report that describes essential topics in medical ultrasound training, a level-based framework to guide trainees to increasing competence, and a competency assessment that involves evaluation of still ultrasound images, movie clips, realtime scanning, or a combination of methods, that can be implemented by individual programs. “This consensus-based curriculum and competency assessment will provide the tools to ensure standardization of ultrasound training in residency programs. Ensuring optimal training of ultrasound in residency programs will result in improved quality of ultrasound examinations in clinical practice,” commented Dr. Abuhamad. Biparietal diameter along with the list of criteria for competency. A teaching example from the curriculum that describes how an important measurement of a developing fetus is made. Ultrasound imaging is dependent on the operator to a much greater extent than computed tomography (CT) or magnetic resonance imaging (MRI). Obstetric ultrasound imaging is particularly challenging, given the small size of fetal organs and the variable fetal position in the uterus. This makes training and competency assessment an important factor in the quality of the ultrasound examination. “Proceedings: Beyond Ultrasound First Forum on improving the quality of ultrasound imaging in obstetrics and gynecology,” by Beryl R. Benacerraf, MD; Katherine K. Minton, MA, RDMS, RDCS; Carol B. Benson, MD; Bryann S. Bromley, MD; Brian D. Coley, MD; Peter M. Doubilet, MD, PhD; Wesley Lee, MD; Samuel H. Maslak, DSc; John S. Pellerito, MD; James J. Perez, DO; Eric Savitsky, MD; Norman A. Scarborough, MD, DABR; Joseph Wax, MD; Alfred Z. Abuhamad, MD. Co-published in the American Journal of Obstetrics & Gynecology, volume 218, issue 1 (January 2018), https://doi.org/10.1016/j.ajog.2017.06.033, published by Elsevier, and the Journal of Ultrasound in Medicine, volume 37, issue 1 (January 2018), http://onlinelibrary.wiley.com/doi/10.1002/jum.14504/full , published by Wiley. “Obstetric and Gynecologic Ultrasound Curriculum and Competency Assessment in Residency Training Programs: Consensus Report,” by Alfred Abuhamad, MD; Katherine K. Minton, MA, RDMS, RDCS; Carol B. Benson; Trish Chudleigh, PhD; Lori Crites, BS, RDMS; Peter M. Doubilet, MD, PhD; Rita Driggers, MD; Wesley Lee, MD; Karen V. Mann, MD; James J. Perez, DO; Nancy C. Rose, MD; Lynn L. Simpson, MD; Ann Tabor, MD; and Beryl R. Benacerraf, MD. Co-published in the American Journal of Obstetrics & Gynecology, volume 218, issue 1 (January 2018), https://doi.org/10.1016/j.ajog.2017.10.016, published by Elsevier, the Journal of Ultrasound in Medicine, volume 37, issue 1 (January 2018), http://onlinelibrary.wiley.com/doi/10.1002/jum.14519/full , and Ultrasound in Obstetrics & Gynecology, volume 51, issue 1 (January 2018), http://onlinelibrary.wiley.com/doi/10.1002/uog.18967/full, published by Wiley. Both articles are openly available in all journals. In addition, credentialed journalists may request full text. Contact Eileen Leahy at +1 732-238-3628; ajogmedia@elsevier.com or Penny Smith at +44 (0) 1243 770448; sciencenewsroom@wiley.com to obtain copies. Beryl R. Benacerraf, MD, may be reached for comment at +1 617-739-0245 or berylbenacerraf@post.harvard.edu. Journalists may reach Alfred Abuhamad, MD, at +1 757-446-5283 or abuhamaz@evms.edu. The American Institute of Ultrasound in Medicine (AIUM) is a multidisciplinary medical association of more than 10,000 physicians, sonographers, scientists, students, and other health care providers. It is dedicated to advancing the safe and effective use of ultrasound in medicine. For more information visit www.aium.org.